Appliance malfunctions and/or misuse can cause for water damage to occur in your home. From your laundry/dishwashing machines to the ice maker in your fridge. Wherever there is an appliance connected to water utilities there is a possible risk for water damage to occur. You may have started a load of laundry in your washing machine, you set it and continue on with your day, when you return you notice water all over your new hardwood floors and water is now leaking into the downstairs unit. What happened? Perhaps the drain hose was installed improperly or it came loose after years of usage, or perhaps a crack in the feedline occurred causing water to escape. Regardless of the cause these are the scenarios that may occur in a home and in fact we deal on a daily basis. Water leaks resulting from washing machine malfunctioning, old dishwasher machine lines breaking, or old fridge water and ice maker copper lines leaking are common causes for water damage in homes across Canada. It is a good idea to check your appliance and toilet feedlines often in order to assess their condition and prevent future water damage incidents. At Incredible Restorations we regularly deal with homes water damaged by appliance leaks. Our water damage restorations experts are experienced technicians able to detect the water source and rapidly clean up the water loss to minimize further damage for your property. 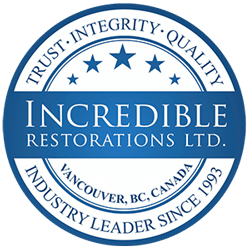 Call Incredible Restorations immediately, we are available 24/7 to assist you with emergency water floods caused by appliance leaks, prepared with the knowledge and state-of-the-art detection tools to rapidly mitigate the issue.